Forecasting can be tricky at the best of times – doing it in something of a data vaccuum this late on is a headache. Despite rediscovering their appetite for interesting opinion polls, the media aren’t commissioning anything like the number they have in the past, so two days before the vote we are still faced with a huge amount of uncertainty. 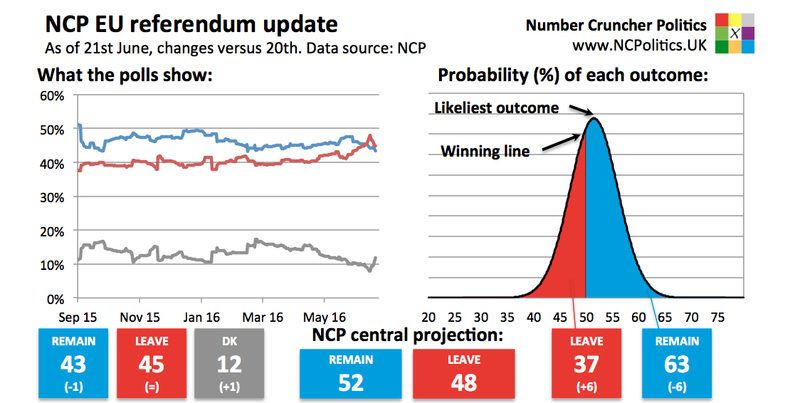 Today’s data have the effect of pushing Brexit probability higher. Due to the lack of polls and lack of time left, individual polls are getting increasingly heavy weights, so the numbers may well be volatile, as they were today. So as things stand, Brexit probability has risen 6 points to 37%. The big unknown is where exactly telephone polls are – if the phone vs online wedge widens again, it’s good news for Remain, but if it stays narrow, it’s good for Leave. And so we come down to the very final polls. We will definitely get further polls tomorrow from ComRes (at 10am), Opinium and YouGov. Ipsos MORI‘s final poll will be released on Thursday morning. We’ll presumably get one more from TNS. We aren’t expecting any further polling from Survation, ICM, BMG or ORB. I will, if possible, provide intraday updates, though this might prove difficult given client and media commitments. Buckle up for the last lap! What’s the real winning line for David Cameron?